We have found you a greatly affordable Singapore airfares for April 2014. Fly to Singapore for $825 r/t, including taxes, and save minimum $140 compared to the rates of other airlines. Travel to southeast Asia during low season (depart on April 1 and return on April 8) and pay less for everything! We have found this China Air flight offer on Travelgrove, but other providers might have even better prices, so compare their prices in the box and book the cheapest airfare that is available right away. Fly from Los Angeles International Airport (LAX) to Singapore Changi International Airport (SIN) from $825 r/t in April. The flight stops in Beijing, China both ways, on the way to Singapore for 10 hours and 15 minutes, while on the way back for 5 hours and 30 minutes. It might look inconvenient, but this may also give you the opportunity for some great sightseeing in the Chinese capital. The China Air airfare our deal hunters have found is exactly $142 cheaper than the next cheapest airline which means you save minimum 15%. Book now, before all the cheapest seats sell out! *Prices featured in the above table are based on round-trip travel and include taxes. Booking this flight gets you over 18 thousand frequent flyer miles with Chna Air Phoenix Miles, the airline’s frequent flyer program. This amount makes up about 18% of a free flight from China to the United States. 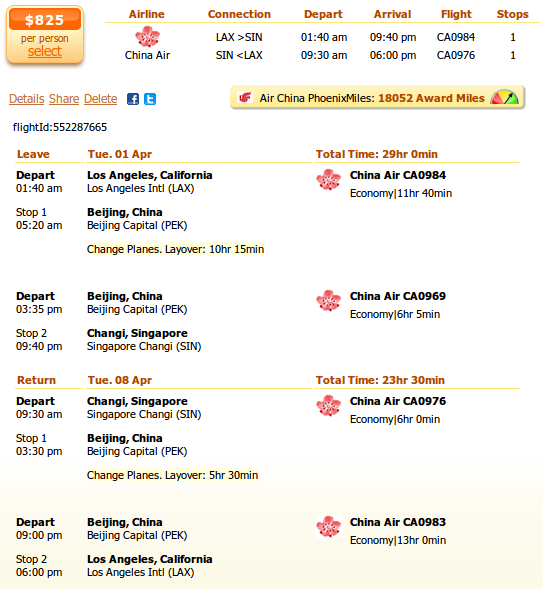 This entry was posted on Thursday, February 13th, 2014 at 11:19 am and is filed under Airfare Deals. You can follow any responses to this entry through the RSS 2.0 feed. You can leave a response, or trackback from your own site.